Jorge Labarga has worked as an assistant public defender, an assistant prosecutor, a private attorney, a trial court judge, and an appellate court judge. Soon he will add a new job: Chief Justice. 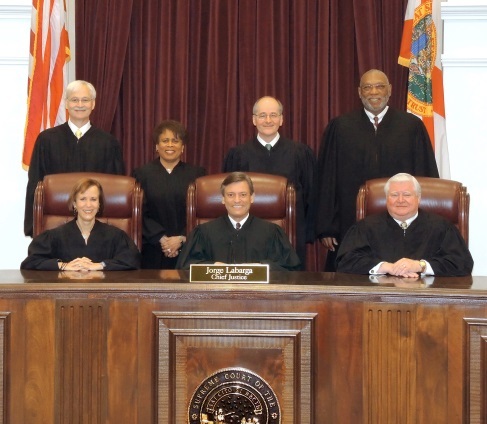 His six colleagues on Florida’s high court voted unanimously on January 29, 2014 to name Labarga Chief Justice-Elect, the first Cuban American to hold the post.. He will begin his two-year term July 1. As Chief Justice, he will serve as the chief administrative officer of the entire state courts system. Only the second Cuban-American appointed to Florida’s high court, Labarga came to Florida as an 11-year-old after the Cuban revolution. Labarga, 61, graduated from Forest Hill High School in West Palm Beach. From there, he went to the University of Florida, where he earned his bachelor’s degree in political science in 1976. Labarga remained at the University to attend law school and received his law degree in 1979. Before he became a justice on the Supreme Court five years ago, Labarga served as a trial judge in Palm Beach County, presiding over civil, criminal and family court cases. He also served as the administrative judge of the circuit’s civil division. Labarga became the state’s 56th Chief Justice when he succeeded Chief Justice Ricky Polston on July 1, 2014.